Carol Davis, a beloved member of the Fellowship of Friends, completed her task on Saturday, August 26, 2017, at 2:40 pm, after a prolonged heart illness. 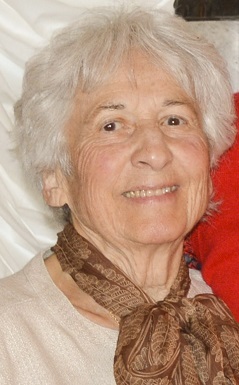 Carol turned eighty-nine on her last birthday, May 17th. Carol joined the School in Chicago, October 1, 1976. After moving to Apollo in 1978, Carol divided her time between Apollo and centers abroad – Paris, Madrid, London, and Moscow – lending her support to each of them. Carol was an accomplished visual artist; her lovely paintings and sculptures grace many of our homes. The experiences are so innumerable and varied, that the journey appears to be interminable and the Destination is ever out of sight. But the wonder of it is, when at last you reach your Destination you find that you had never travelled at all! It was a journey from here to Here. I remember Carol when our London Centre was at Hatfield House. I took photos of her wedding and the happy couple riding off in a horse and carriage. I also have a drawing of Robert that Carol gave me, Robert looks young and handsome.